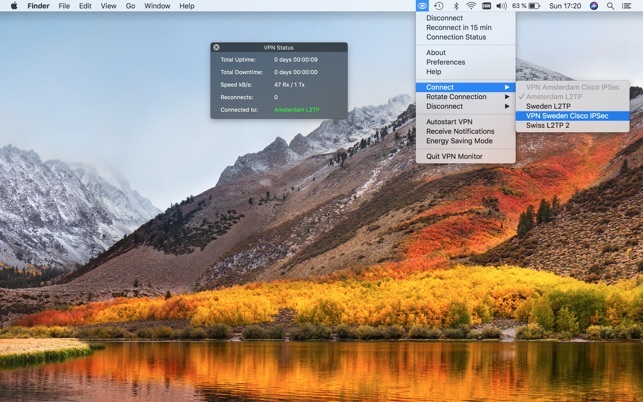 VPN Monitor is a status bar application to immediately reconnect a dropped VPN connection. VPN Monitor is completely ad-free, safe and private. 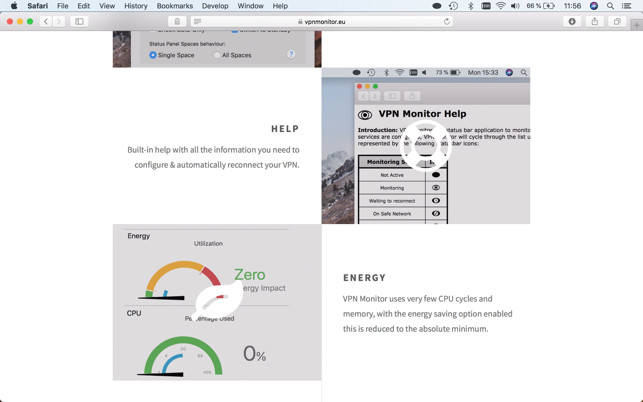 The flexible 'Always On' VPN solution for macOS - limits your VPN downtime to the absolute minimum! VPN Monitor does not include a VPN subscription and will not block outgoing traffic while the VPN connection is down. 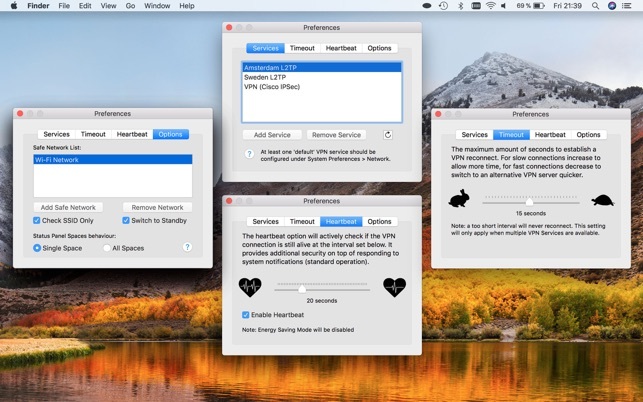 At least one 'default' VPN service should be configured under macOS. See VPN Monitor's built-in help for details on correct VPN configuration. For IKEv2 support please use the app "VPN Monitor IKEv2". 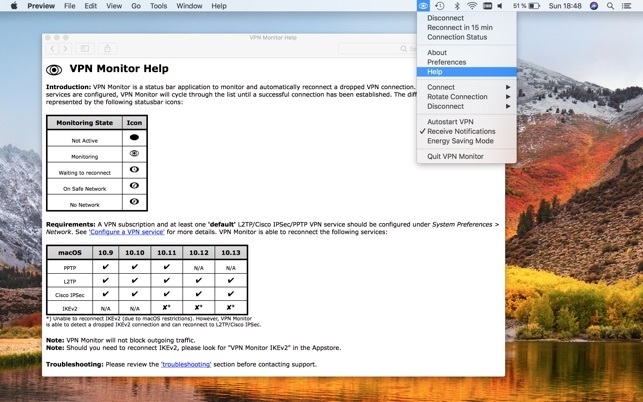 The App gets notified of changes in macOS network connection status and immediately takes the required actions. Its efficient connect, reconnect and fallback approach ensures carefree operation. 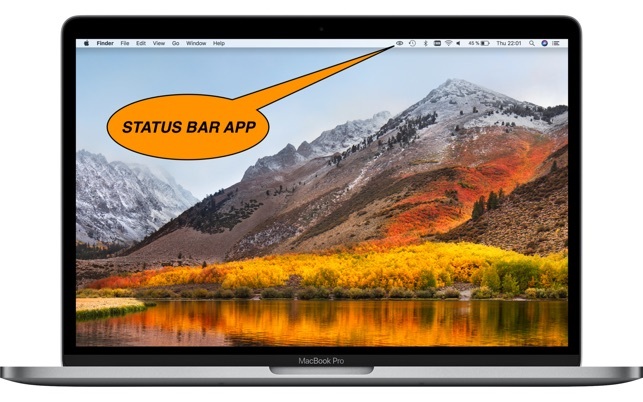 There is no CPU and energy intensive 'status polling' involved (as in AppleScripts or other Apps). If you like this app, please take some time to rate it. The only quirk is the whitelist for network SSID’s is based on the MAC address of the device you’re connecting to, rather than the SSID. When I’m at work as I roam the building with different hotspots that all utilize the same SSID I have to whitelist each and every one of them. I wish I could just whitelist anything using that SSID name rather than idividual MAC addresses. Initially had a problem with an older OSX. Contacted support, and the App Store was updated with the fix less than 24 hours later! VPN has been perfect ever since. I tried other apps all of which had various problems. Unfortunately their developers were non-responsive. More features, better support, cheaper price… VPN Monitor is a great App. This app now works as described and works extremely well. I use it all the time when I’m out being a roadwarrior. I do wish it would be possible to implement the IKEv2 format into this. Will give 5 stars if IKEv2 can finally be implemented.